Slow Rolling Home sees it's first snow. When you've cut holes in your roof and are relying on the strength of sealant, lengthy periods of wet weather are kind of concerning. Nothing is more validating than seeing your bus in its first snow and having no leaks whatsoever! We Floridians are also enjoying our first winter as well, enduring blustery evening runs, freezing morning dog walks, and driving country roads on ice. As well, enjoying hot coffee, delicious soup, and warm nights by the fireplace. Our jobs have taken us to some lovely places and at the start of the new year, we've slowed down to focus on finishing the bus and preparing for our next adventure. This means a little less going out, a little less work, tighter budgets, but more days on the horizon for construction. 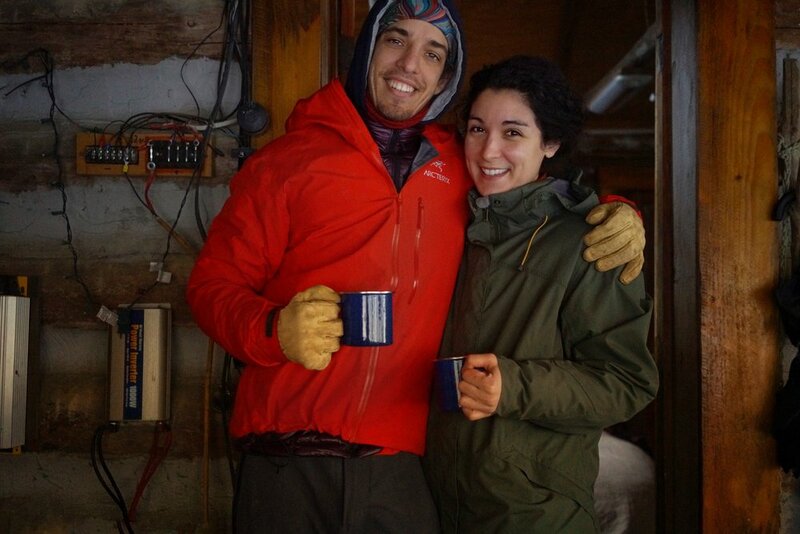 Our friends Jared & Haley of Tiny Mountain Rhodes joined us again for a productive workday installing the ceiling. It's at least a three person job to install each ceiling panel. Radius bending plywood is fantastic for our bus's domed ceiling and it makes almost the entire curve... but it's not very strong. And denim insulation is not very light. This may be why plenty of skoolie converters leave the original ceiling in-tact and simply add onto it. Our re-insulation has been a boon. We found after attempting to affix the ceiling to the metal frame, we'd need to install an array of wood blocks for added support. The last thing we want is to hit a bump and our ceiling come crashing down! This all happens so fast that it's easy to make mistakes, but having given it enough tries, we got the hang of it! We're a third of the way to a completed ceiling. Preparing the bus for impending inclement weather took precedence. We re-installed exactly six rivets back into the slow rolling home. If you're familiar with our previous construction posts, you can reminisce with us over the absolute nightmare it was to remove thousands of rivets from our bus by hand. We accidentally removed rivets from a window hull that required them for re-installation, so Alhen sourced this little guy to help us do the deed. With a little help from Haley, we sealed a few windows before the snow storm rolled in! For almost a month, the slow rolling home wouldn't start. Alhen went to start her up like any other time and when he turned the key, lights and sounds went on but the starter wouldn't turn. The starter didn't even move. This is what happens when the emergency exit door is open - if you try to start the bus and the back door is ajar, the bus thinks all the kids are going to fall out of the back and doesn't start. Taking into account that we'd previously did work on the electrical system, Alhen started there to find the solution. He traced it back through to the starter and the solenoid that prevents the starter from turning over in the event that the rear door is open. We asked friends who were familiar with the engine and who were familiar with busses but we still couldn't get her to start. One morning, Alhen heads outside to give the bus a start-attempt after a month of troubleshooting. Chugging slowly at first then roaring to life, THE SLOW ROLLING HOME STARTS! Cue the confetti! The brakes give us the familiar hiss of full-pressure! We're celebrating! "Hey Amelia, I need your help. I can't turn the bus off." With a little ingenuity and confirmation from a couple trusted sources, we found a solution. Pulling the battery cable shut the bus off and gave us a moment of quiet to digest this new development. We both agreed that while the bus had been running, it sounded harsh, ragged, not the rumbling diesel she usually is. Later on, Alhen gave the bus another start and found the same problem: couldn't turn the bus back off. We believe it's an issue with a starter that may need expert (or at least experienced) repair or replacement. The Slow Rolling Home is heated! Though this installation is temporary, our Cubic Mini Grizzly Woodstove has been a valuable improvement to indoor working conditions! Our bus was previously a frozen tin-can and is now a fairly brisk but pleasant workshop. The family recently joined us for a tour and keeping six people relatively comfortable was rewarding. Getting to know the woodstove will help us determine exactly how we'd like it permanently installed. This is its forever home but the wall, ceiling, and any heat-reductive surface treatments are still in-progress. From our weekend cabin getaway. Something that weighs on our minds and hearts: our timeline. Ours has been a tremendous learning experience. So far, we've learned about each other's working styles and expectations, our investment into this project, how to work well together, what we need outside the conversion to keep our lives moving, how to accept setbacks and take breaks, staying positive when our loved ones don't understand or our challenges surmount. We've grown, become stronger, been knocked down, and exceeded expectations. We're so excited to embark on the next adventure, but we're also steadily focused on completing our home. More updates to come as we finish installing the ceiling, frame our major walls and room features, and install the off-grid systems in preparation for launch!